Old Mother Goose lived in a cottage with her son Jack. Jack was a very good lad, and although he was not handsome, he was good-tempered and industrious, and this made him better-looking than half the other boys. Old Mother Goose carried a long stick, she wore a high-crowned hat, and high-heeled shoes, and her kerchief was as white as snow. Then there was the Gander that swam in the pond, and the Owl that sat on the wall. So you see they formed a very happy family. But what a fine strong fellow the Gander was! Whenever Old Mother Goose wanted to take a journey, she would mount upon his broad strong back, and away he would fly and carry her swiftly to any distance. Now Old Mother Goose thought her Gander often looked sad and lonely; so one day she sent Jack to market to buy the finest Goose he could find. It was early in the morning when he started, and his way lay through a wood. He was not afraid of robbers; so on he went, with his Mother’s great clothes-prop over his shoulder. The fresh morning air caused Jack’s spirits to rise. He left the road, and plunged into the thick of the wood, where he amused himself by leaping with his clothes-prop till he found he had lost himself. After he had made many attempts to find the path again, he heard a scream. He jumped up and ran boldly towards the spot from which the sound came. Through an opening in the trees he saw a young lady trying to get away from a ruffian who wanted to steal her mantle. With one heavy blow of his staff Jack sent the thief howling away, and then went back to the young lady, who was lying on the ground, crying. She soon dried her tears when she found that the robber had made off, and thanked Jack for his help. The young lady told Jack that she was the daughter of the Squire, who lived in the great white house on the hill-top. 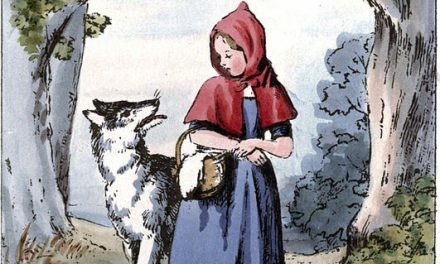 She knew the path out of the wood quite well, and when they reached the border, she said that Jack must come soon to her father’s house, so that he might thank him for his noble conduct. When Jack was left alone, he made the best of his way to the market-place. He found little trouble in picking out the best Goose, for when he got there he was very late, and there was but one left. But as it was a prime one, Jack bought it at once, and keeping to the road, made straight for home. At first the Goose objected to be carried; and then, when she had walked along slowly and gravely for a short time, she tried to fly away; so Jack seized her in his arms and kept her there till he reached home. Old Mother Goose was greatly pleased when she saw what a fine bird Jack had bought; and the Gander showed more joy than I can describe. And then they all lived very happily for a long time. But Jack would often leave off work to dream of the lovely young lady whom he had rescued in the forest, and soon began to sigh all day long. He neglected the garden, cared no more for the Gander, and scarcely even noticed the beautiful Goose. But one morning, as he was walking by the pond, he saw both the Goose and the Gander making a great noise, as though they were in the utmost glee. He went up to them and was surprised to find on the bank a large golden egg. He ran with it to his mother, who said, “Go to market, my son; sell your egg, and you will soon be rich enough to pay a visit to the Squire.” So to market Jack went, and sold his golden egg; but the rogue who bought it of him cheated him out of half his due. Then he dressed himself in his finest clothes, and went up to the Squire’s house. Two footmen stood at the door, one looking very stout and saucy, and the other sleepy and stupid. When Jack asked to see the Squire, they laughed at him, and made sport of his fine clothes; but Jack had wit enough to offer them each a guinea, when they at once showed him to the Squire’s room. Now the Squire, who was very rich, was also very proud and fat, and scarcely turned his head to notice Jack; but when he showed him his bag of gold, and asked for his daughter to be his bride, the Squire flew into a rage, and ordered his servants to throw him into the horse-pond. But this was not so easy to do, for Jack was strong and active; and then the young lady come out and begged her father to release him. This made Jack more deeply in love with her than ever, and he went home determined to win her in spite of all. And well did his wonderful Goose aid him in his design. Almost every morning she would lay him a golden egg, and Jack, grown wiser, would no longer sell them at half their value to the rogue who had before cheated him. So Jack soon grew to be a richer man than the Squire himself. His wealth became known to all the country round, and the Squire at length consented to accept Jack as his son-in-law. Then Old Mother Goose flew away into the woods on the back of her strong Gander, leaving the cottage and the Goose to Jack and his bride, who lived happily ever afterwards.